In another demonstration of Israel’s willingness to help respond to disasters, a search-and-rescue team of 130 members from the Israel Defence Forces (IDF) landed in Brazil late on Sunday evening to help local teams search for hundreds of people who are missing after the collapse of a dam near the south-eastern town of Brumadinho. 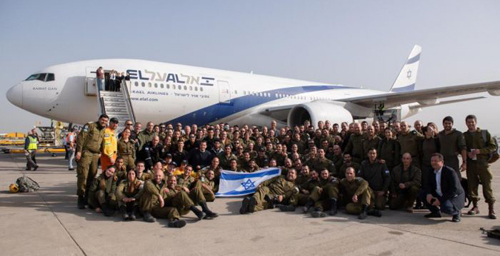 The Israeli search-and-rescue team before departure for Brazil. Search operations were halted for some hours on Sunday when fears arose that another dam in the area, owned by the same mining company, was also at risk of collapse. 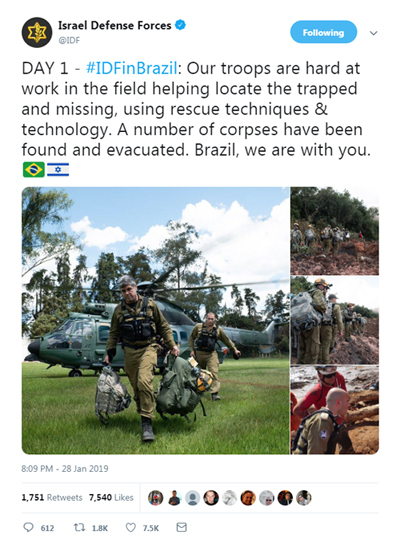 Israel’s Prime Minister, Benjamin Netanyahu, launched the IDF rescue mission late on Saturday after he had spoken to Brazil’s President, Jair Bolsonaro, and offered immediate assistance. The Israelis are well-prepared to respond quickly in situations like this. Their team is led by Col. Golan Vach, the commander of Israel’s national search and rescue unit. It includes soldiers and officers from both active and reserve forces, including engineers and doctors as well as search and rescue personnel, firefighters and specialists in underwater operations. Late in the day yesterday, the IDF team posted some photos of their work on Twitter. It looks to be challenging physically, mentally and spiritually.